Me: "Here is what you need for the water park trip on Saturday......A modest bathing suit...a towel....toothbrush...."
12 year old female student: "What is a modest bathing suit?" Me: "One in which unnecessary flesh is not showing simply for cosmetic purposes." 12 year old female student: "Well, looks like I am going bathing suit shopping." I am growing more and more afraid for when my daughters are teenagers. I have one who is 12 and the other is almost 3. What is this world going to be like when they are older. My oldest is almost there right now. She is a good girl and hope to not see any problems from her. But my youngest is a bit rebellious and I foresee more rebellion in the future. How exactly does one father a daughter in this society at all and keep his sanity? 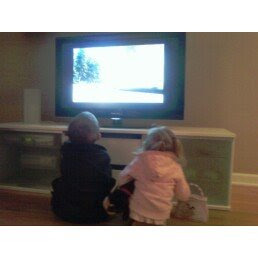 Perhaps if they didn't sit so close to the TV. Don't think I haven't already ordered them the model Burke posted. Funnnnny... Now I know what the problem was..I raised two girls with big "60" televisions. I'm saying burquini all the way. No flesh allowed.